Parasites belong in the guts of someone (or something) other than me. 130 different species living in a bodily container that usually holds chocolate parfaits and Kung Pao chicken is not something I want to see outside the walls of my stomach. But sensible people rarely listen to me, and they proceeded to create a museum dedicated to parasites. 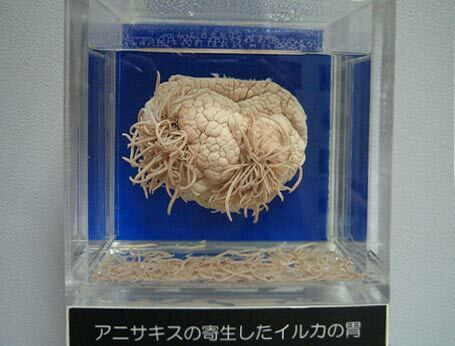 The Meguro Parasite Museum in Tokyo is a short, fifteen minute uphill walk from the subway stop. How many neighborhoods in Tokyo have this type of museum? Only one. So on Tuesday afternoon, I bought a map (just for reference) and pointed to my stomach several times as I walked down the street asking for directions, trying to create some cultural middle ground. The official name “Kiseichuu Hakubutsukan” might mean 30 foot tapeworm because that’s one of the main attractions upstairs on the second floor. 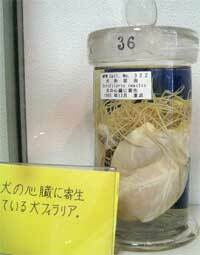 There are actually five parasite museums in the world. This one boasts the longest of the tapeworms. Parasites and museums are usually not spoken of in the same sentence, so I wasn’t surprised when I approached the nondescript, two-story brownstone. Its lack of architectural dimensions actually soothed me. I couldn’t imagine a Frank Gehry-like monstrosity housing a dedicated presentation of parasites. As I stepped through the front door, I looked forward to the number of times I would say “Gross” and “That’s ” disgusting – my expectations soon met my reality. The first floor consists of a general overview of parasites while the second floor focuses on the parasite life cycle, showcasing 300 actual specimens. Walking up the stairs, one thought badgered me: Do I really need to see a few hundred parasites? I think after two or three I had a pretty good idea. 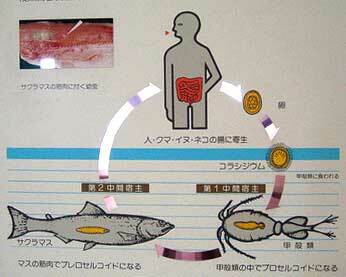 On the second floor, I found maps pinpointing areas all across Japan where specific types of tapeworms are found. Drawers and free standing displays educate the tourist. This is one place where tourists are encouraged to ask lots of questions. Not surprisingly, I was the only one there on that Tuesday afternoon. A guide suddenly appeared from some back room and gave me a private tour, escorting me to several long, shiny white tables where more tapeworms and parasitic creatures existed. There is not enough room for all the exhibits, she explained. Lucky me. While being granted twenty more minutes for the privilege of observing more preserved parasites and experiencing my guide’s unbridled parasitic enthusiasm made me wish the day would never end, what I enjoyed most was the gift shop. Even in a tiny museum like this, a reserved chunk of space existed to shill souvenirs. Counter and glass case held all parasite souvenir essentials. Japanese culture loves to turn almost anything (beer foam, poop) into a cute rendition of its former self; a representative that allows a certain kind of intimate relationship that no one would ever acknowledge or desire otherwise. The mascot is very similar to a mutated butterfly with exaggerated ears. They call it Diplozoon. It’s part of the motif for cell phone straps, key chains, pens, postcards, rulers, and stickers. There’s even an amber sealed parasite key chain. If that doesn’t get you excited, they offer t-shirts and jewelry with embossed rainbow colored tapeworms. As I left the museum, I shook hands with my guide and asked if the museum ever gets busy. When do people show up? I wanted to know. She looked at me, smiled wistfully, and said, mostly before lunch. This entry was posted on Tuesday, August 19th, 2008 at 9:30 pm	and is filed under Geotagged, Must See Geography, Off the Charts CrAzY!, travel. You can follow any responses to this entry through the RSS 2.0 feed. You can skip to the end and leave a response. Pinging is currently not allowed.